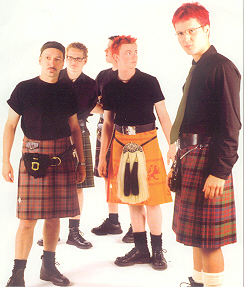 Meet Enter The Haggis, an explosive Celtic-rock quintet band based in Toronto, Ontario. The band combines the traditional sounds of the highland bagpipe and fiddle with a powerhouse rhythm section and strong vocals to creat an infectious hybrid of old and new. Their raucous live show has made them a favourite at festivals and clubs across North America since their conception in 1996. Enter The Haggis makes new friends everywhere they land. In fact, they are invariably the top selling act at every festival they play. And fans just can't get enough of Enter The Haggis. Meet the band: Brian Jonathan Buchanan born in Ottawa does vocals, fiddle and acoustic guitar-Craig Crog Dowie born in Glasgow, Scotland does vocals, highland pipes, deger pipes, acoustic guitar and tin whistles-Trevor Sidney Lewington born in Toronto plays electric, ascoustic guitar and vox-Mark Andrew Abraham born in Hamilton plays bass guitar and vox-James Matthew Campbell born in Sault Ste. Marie plays drums. The band made its debut at Toronto renowned NXNE Music Festival in 1996 and has never looked back. 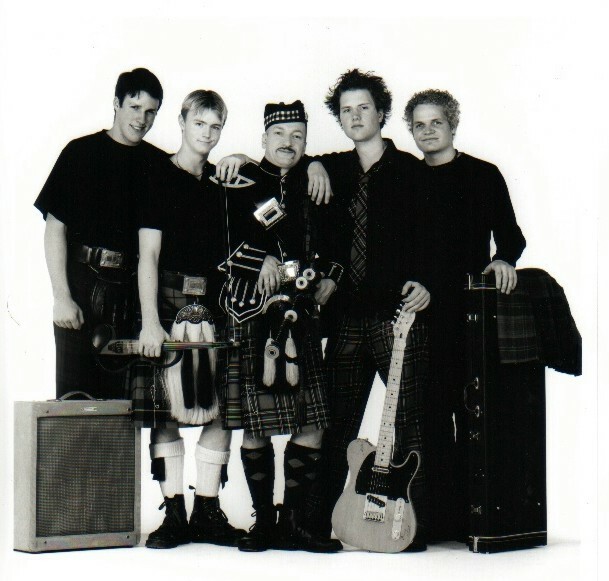 In June of 1998, the band released their first full-length CD entitled, Let the Wind Blow High and since released Aerials in 2001 and Enter The Haggis -Live in 2002. They will be releasing a new album April 2004 entitled, Casualties of Retail. Enter the Haggis had many highlights throughout their career thus far including appearing on stage with many popular artists and made many television and radio appearances. They have appeared in many music festivals across North America including in Florida, New York, Pennsylvania, Virginia, Massachusetts, B.C., Ontario, Saskatchewan, and Alberta to name a few. This year 2004, is looking good for the band, with the release of their new CD they are already booked for several festivals such as, The Sound of Music Festival, Burlington-Canadian Tulip Festival in Ottawa, Niagara Folk Arts Festival in St. Catharines and Summerfolk Festival in Owen Sound. For further information regarding the band and their music, check their website, address posted above.